I am going to have SO much fun with DIY projects over the next couple weeks. One of my girlfriends is getting married in August and is having a gorgeous DIY, shabby chic, backyard wedding complete with giant size lawn games and I get to make them!! This is going to be a multiple post series and I’ll finish it up with some actual photos from the wedding with the games actually being put to use. Today, I’m showing the DIY for creating giant dice for Yard Yahtzee and stay tuned for the next post to be DIY Yahtzee Scorecards. I started with a 4×4 pine post. Lowe’s sells them in 8 foot length, I brought the whole thing home because I’m sure I’ll find a use for the rest of it but you can also have them cut the post for you. They will usually make up to 5 cuts for you at no extra cost and keep the extra if you don’t want it. If you choose this option, have them cut 5 squares. The actual measurement of a 4×4 is really 3.5×3.5 so have them cut 5 – 3.5×3.5×3.5 squares. I just used my jig saw to cut them at home. Once the blocks were cut, I took my electric hand sander to the blocks to round the edges and corners and smooth out the surfaces a bit. Next, its time to make the dots on the dice. Now, you can simply paint them on if you want. I decided to drill small holes that I would later paint black. I did this because I knew I wanted to sand the surface of the dice down once I had them painted to get a shabby chic look but I didn’t want too much of the spots to be sanded off in the process. I probably made more work for myself but it worked out and I loved the end result. I used a straight edge and a pencil to draw an “X” on each surface of the dice to make sure my spots were symmetrical. Then just a couple turns of the drill bit and I had perfect spots on each block. Next, it was time to paint. I used Heirloom Traditions chalk paint in “A la Mode” to paint the blocks white all over in 2 coats, then I used “Black Bean” to paint the dots. Finally, I used my electric hand sander to “rough them up” a bit. I sanded each surface and edge with 80 grit sandpaper to get an aged, shabby chic look. I finished them up with Heirloom Traditions Wax to protect the surface from water and grass stains. 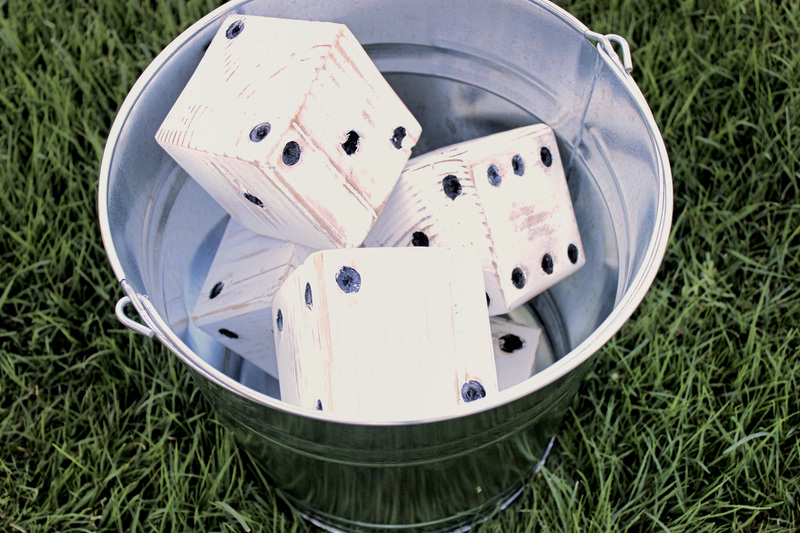 Use a galvanized bucket to throw the dice during the game for a cute, country touch. Stay tuned for the next DIY post, Yahtzee Chalkboard Scorecards! You’re AMAZING!!!! This is the most gorgeous lawn game to date, can’t believe it was made for my wedding! !